Whether you're coming here for care or to visit a loved one, we have a number of convenient parking locations, plus complimentary valet parking at Cox Medical Center South. Just download the map you need. What is valet parking? Does the valet cost anything? Where do the vehicles go? Who is driving the vehicle? Is the valet insured? How long does it take to retrieve a vehicle? 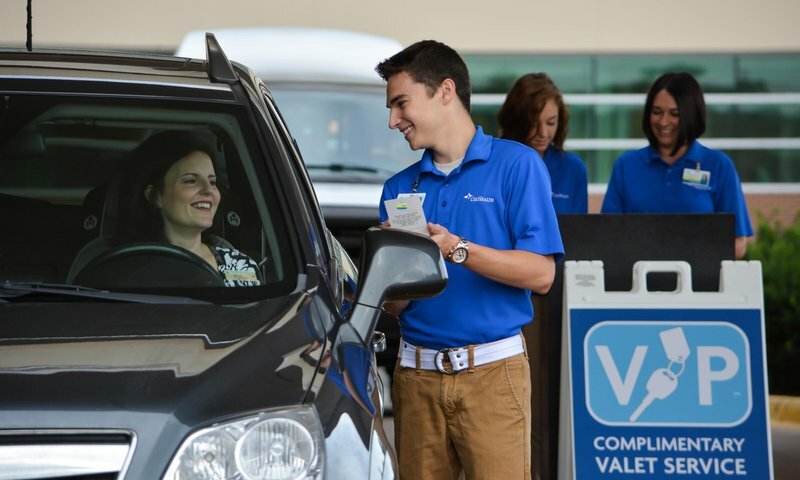 What if a customer loses the valet claim ticket? What are the hours of the valet service? What if a customer can’t retrieve a car before the valet closes? Who should customers contact if there is an issue with a vehicle or the service? Valet parking is simply a service provided at a restaurant, airport, hospital or other venue whereby an attendant parks and retrieves patrons’ vehicles. Does the valet cost anything? Where do the vehicles go? Vehicles go to a secure area or lot where they will be safe in our custody until the owners need them back. Who is driving the vehicle? Vehicles will be driven by a licensed and insured attendant who has been trained on where and how to operate the vehicle. Yes, the valet service is insured against any negligence or accident while vehicles are in our custody. We suggest customers take precautions and not leave extremely valuable items in the vehicle. We also inspect and take pictures before the vehicle is parked to ensure we return it in the same condition as before. How long does it take to retrieve a vehicle? What if a customer loses the valet claim ticket? Customers are asked to please take care not to lose the ticket, but if it happens it is not a problem. We will ask the customer’s name when dropping off the vehicle and we can identify the vehicle by the customer name and the make and model of the car. We will need to see proof of ownership such as registration and identification before the car is returned. What are the hours of the valet service? Our service is from 6:30 a.m. – 7 p.m., Monday through Friday. Hours may vary on holidays. What if a customer can’t retrieve a car before the valet closes? We collect customer phone number as we park. If we are approaching closing time we will attempt to make arrangements with customers to return keys. If we can’t make contact, we are on call 24 hours a day and with a phone call to our office we will have keys back to their owners within a few minutes. Who should customers contact if there is an issue with a vehicle or the service? Please contact Springfield Parking Company at 417-832-0612.